Lots off Grey's Anatomy merchandise (DVDs, T-shirts, mugs, autographed Sandra Oh photos, note pads, sunglasses, chapstick & more) is being offered as perks when you donate & then refer other donors to theWindow Horses IndieGoGo (IGG) campaign. Window Horses is an animated film currently in development and seeking crowdfunding. Sandra Oh has been cast as the lead ("Rosie Ming") and also serves as Executive Producer on the film. The Grey's Anatomy merchandise being offered is from Sandra's personal collection. Check out the photos below and see the IGG page for full details. FYI ~ Kevin & Sandra have promised to tweet a photo if Window Horses reaches 10,000 Twitter followers. Read more about DVD formats. Remember that controversial musical episode of ABC’s Grey’s Anatomy that aired last spring? Honestly, how could you forget about it? Well, that memorable hour is the focus of some of the extras on the upcoming DVD release of the show’s recent seventh season. Growth rarely, if ever, happens in a straight line. And even when we have all the tools required for the job and a clearly laid out map or instruction sheet, we may still feel ill-prepared to take that next step. Because no matter how well we try to plan for every eventuality, or feel we know ourselves and our capabilities, we can still be brought up short by what life has in store for us. Through the process of juggling busy professional lives alongside meaningful personal relationships, we saw the doctors of Seattle Grace/Mercy West stepping into dreams they never thought they’d have or want, which created both unexpected stresses and rewards. As the impact of these different versions of their dreams began to be felt, these characters discovered life could rapidly become more than that for which they had bargained and yet that it also broadened their perspectives and allowed them to approach their lives and their relationships more deeply while also still sometimes finding themselves stymied by how to move forward. Some hid from change, as Chief Webber did initially in deciding Adele’s health concerns were simply an unfortunate confluence of forgetfulness and household accidents. Some bought processing time for themselves in explaining their reluctant reaction to the other people involved as Arizona did in telling Callie a life raising a child with her and Mark Sloan was ‘not my dream. My dream does not look like this.’ Some avoided the subject all together as Meredith did in not telling Derek her fertility treatments were impacting her eyesight. And some attempted to flex new emotional muscles and found themselves flummoxed by that process into retreating into old behavior as Owen and Cristina were as they stumbled into discussions of whether or not to have children. As we first experience tragedy it feels as if we will never get past it, that the event will always be primary in our minds. Yet as time passes and we amass both the triumphs and pitfalls of daily living we start to move beyond that tragedy, finding ourselves changed by the event and yet also ready to again savor the normalcy of life as it unfolds before us. Our perceptions are often still colored by the tragedy we experienced but with time we can internalize the lessons of that event as we begin to carry it less heavily and move into a more aware future. The middle of season seven saw most of the staff at Seattle Grace/Mercy West finding ways to move past the shooting which occurred at the hospital at the end of the previous season. Some had regained their stability and were ready to take chances to enjoy life again, as Miranda Bailey did upon finding herself on the receiving end of some serious flirting from Eli, an attractive nurse. Others found themselves turning both a professional and personal corner as Alex Karev did upon both committing himself more strongly to pediatric surgery as his future specialty and putting in an appearance back home for his brother's commitment hearing. And yet still others found themselves sinking fast under the weight of fighting their feelings about the shooting, as did Cristina Yang who now faced the fallout of having left her hard-won residency behind and, as a result, experienced a disconcerting lack of structure in her life. Meanwhile, her husband Owen Hunt found his frustration level rising as he struggled with how to help Cristina regain herself. Running out of ways to channel the energy formerly harnessed by her surgical endeavors, Cristina was at a loss for how to fill her days. Owen watched his wife spin through attempts at decorating their new home and throwing a house-warming party followed by a disastrous run at bartending which left him saddened by the loss of Cristina's formerly energetic demeanor. However, as Derek warned Owen when he arrived after a long night of surgery to pick up Cristina who was drunk at Joe's Bar, "it's not as bad as it looks." Change is inevitable no matter how much we try to avoid it. And as frightening as change might be it also provides some of the greatest rewards we’re likely to find in this life. It’s the journey to that change, how we step into it, and who goes along with us for the ride which shows us how we can become more than we ever thought we’d want to be. As the staff of Seattle Grace/Mercy West discovered after facing a grieving widower with both a gun and a grudge at the end of season six. Besides the obvious up close and personal view they got of their own and each other’s mortality, they also uncovered a deeper understanding of their paths through life. While metal detectors and guards were installed at all hospital entrances, the surgical staff discovered such changes to their physical environment had little impact upon their internal sense of security. Some staff found renewed purpose in the face of the crisis, like Owen Hunt, who found clarity in his heart and renewed professional purpose which enabled him to step into both proposing to Cristina Yang and also becoming a more clearly defined hospital leader. Being able to draw upon his wartime experiences when it came to both standing by Cristina during the shooting and also afterward in her healing process, Owen grew into a more tempered version of the man we’d first met home on leave from the army. He best expressed his growing professional confidence and vision in appealing to Chief Webber to offer emergency preparedness training to hospital staff to help them better act in the face of such tragedies. Charles Percy had a gunshot wound to the abdomen. Miranda Bailey did everything she was trained to do. She gave him fluids, controlled the bleeding, applied pressure. Then she tried to get him to an OR, but she couldn’t. So he died… And she’ll remember him dying in her arms the rest of her life. And I’ll remember… And you’ll remember that we could’ve saved him. We failed her. And we failed Charles Percy, one of our own doctors. I can’t face that… I can’t face that ever again. Can you? At the same time as Owen regained his confidence, Cristina became ever more vulnerable. She was afraid in her own skin, moving outside her usual bravado to admit her deepest abandonment fears but also keeping from herself and everyone else, including Owen, how deeply the shooting had impacted her. She stepped into planning their wedding quite energetically, regaining some of her usual sass in the process, calling the tradition of brides wearing white ‘sexist and vaguely racist,’ while Owen was simply giddy with delight at the idea of marrying Cristina and formalizing their life together. And yet we all knew it wasn’t going to be easy for these two strong personalities to step into marriage, to which Meredith’s voiceover attested in the episode that celebrated their wedding. When we say things like "people don't change" it drives scientist crazy because change is literally the only constant in all of science… It's the way people try not to change that's unnatural. ... Change is constant. How we experience change that's up to us. It can feel like death or it can feel like a second chance at life. If we open our fingers, loosen our grips, go with it, it can feel like pure adrenaline. Like at any moment we can have another chance at life. Like at any moment, we can be born all over again. Relive every heartbeat PLUS the extended Music Event – only on DVD! Let the healing begin. Primetime television's most beloved doctors return for an unprecedented season of emotional twists and turns. 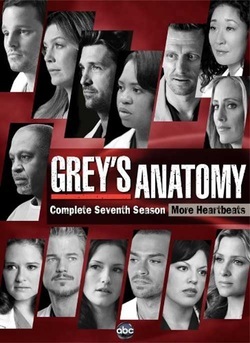 Relive every mesmerizing moment with ABC's Grey's Anatomy: The Complete Seventh Season. It's a year of new beginnings for the medical team of Seattle Grace Hospital as they slowly recover from the tragedy that hit too close to home. New relationships emerge and the strongest commitments are tested in this moving 6-disc set. From successes in the operating room to mistakes in the bedroom – and all the thrilling drama in between – the doctors find a way to survive as long as they lean on one another. Relive every heartbeat and get even more – including the extended version of the moving Musical Event and music videos featuring the doctors like you have never seen them before – only on DVD. "7.5 the season that fixes everything"